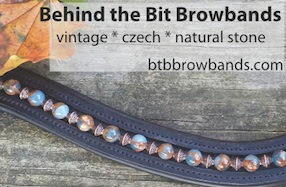 One of my first really popular blog posts was Bring on the Bling (on the topic of browbands). My aesthetic and style have come so far since then (sheds wistful tear)! What jazzed me back then -- the typical single strand beaded dressage browband -- now they seem, well, so YESTERDAY. The discerning equine enthusiast -- the ones who can never own enough horse accoutrements -- are turning to the woven beaded browbands, which are growing in popularity. Have you seen them? This one is from the HPF Designs beadweaving page. These are browbands with interchangeable beads. Designer browbands This one is really different! That was crrraaazyy! I looked at the last one you listed. $189?! (falling on the floor) I SO need to do this as a hobby business.... I'm just amazed. They sure are pretty! Those are very fashionable! I like the pink sparkly one best. You probably remember that you inspired my dear FarmWife to great heights of creativity with your last bling post . . . this is the results of her efforts! I love them! I have a friend that I rode with in college that now makes them and sells them on etsy. She obivously has other stuff too. I think when the farrier comes next time, I'm going to have him give me one of Bella's shoes and send it to Meaghan to make into a wall hanging. Can someone please find me a punched leather browband?! A friend has one that she bought from a vendor at a horse trial, but she can't remember who the vendor was! Its a lovely black browband, with a row of alternating tiny circles and diamonds punched out, exposing a deep blue leather underneath. Very nice for geldings!! !